Digital Editions have taken center stage in publishing today. Verified would like to get your opinions on Digital Editions and find out if you are making them a part of your overall distribution strategy. Please take our short survey by clicking on the "WebSurveyor" logo below. We appreciate your feedback! Find the top advertisers in your local market. Offer unlimited pages, print and online, until they reach their goals. The per-page cost of newsprint is cheapand the per-impression cost of online is even cheaper. Figure out how to capture 100% of their ad budget. Offer a free daily aimed at your least committed readers and an elite daily sold at a much higher price. Present readers and advertisers with an optionone free and one premium. Given the demographics, you can charge more for ads in the elite daily. You can save space and money by putting some featureslike stock and TV listingsonline. Rethink everything and ask the hard questions. What news do your readers really want? Do you need a Saturday edition? Can a blogger cover some of your stories instead of a reporter? Which features are crucial and which won't be missed? A local touch is a newspaper's unique quality. Focus on your core constituency, covering stories of regional or local concern too particular for large news agencies. Now, more than ever, production values matter. A better-looking product attracts more affluent readers. Take advantage of reader-written content. There are many talented people out there who don't work as full-time journalists. Get them to work for you. In the small town of Atwater, Minnesota (population 1,054), the local paper finally ran a story about the high school homecoming candidatesmuch to the delight of proud Atwater parents. This is not unusual for small-town papers, but the town's last newspaper wasn't always on the same page with the local residents. That previous paper, The Atwater Herald, shut down in the mid-90s. Enter a different kind of paper ready to lead with an innovative strategy for keeping small-town news alive. 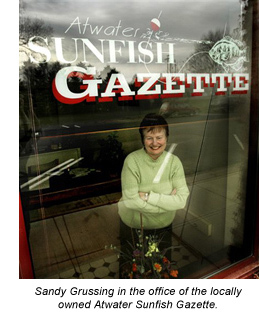 The Atwater Sunfish Gazette (the name was picked in a contest) is a nonprofit, eight-page, biweekly which was first published on October 12, 2005, by a group of local citizens. The Sunfish is managed by a board of directors, a requirement for nonprofit businesses. The board members include a city clerk, two pastors, a Web designer, and an elementary school principalall of whom expressed interest in starting the paper. It is a business model that seems to present a viable solution for meeting the news needs of smaller communities that have lost their local papers. Along with advertising revenue, The Sunfish is supported by donations and community volunteers. With circulation growth unlikely, the paper has hosted several fundraisers, including a raffle, a phone campaign, and self-mailer envelopes included in the paper. Editor Sandy Grussing is the one paid staffer. Grussing is responsible for final writing, editing, design, advertising, circulation, and printing. She even delivers the papers to the post office to have them mailed to Atwater households. The Sunfish's free distribution gave it an instant circulation base. Almost every business in town bought ads. Before this, local businesses could only advertise in the nearest daily, Willmar's West Central Tribune, about 15 miles west. Ads were expensive and readers of that paper were unlikely to shop in Atwater. "It was really hard to get information about the school, about sports," said Laverne Pickle, a retiree and 50-year Atwater resident. "What we had was posters on bulletin boards and announcements in the church bulletin and notes sent home with kids," said Connie Feig, a nurse and the chairwoman of the paper's board of directors." Volunteers initially raised about $13,000. Office space has been donated. Each issue has cost about $1,800 to produce. Board members, residents, and other volunteers write, sell and design ads, take pictures, proofread, paste up pages, run errands, and make coffee. None have had any prior newspaper experience. Several months into the venture, The Sunfish is now trying to determine if it can afford to go weekly. Margaret Weigelt, a librarian and board member who has helped Grussing put together several issues, says, "When you have a newspaper, I think it strengthens the identity of the area, validates the existence of the community, and it starts to feel more real." "They consider it their paper, not the publisher's paper," said Grussing. Jim Desser, COO of Verified, will be attending the Midwestern CMA. Jim would be happy to answer any of your questions and talk about the valuable services Verified provides. Tim Prouty (CEO) and Jim Desser (COO) of Verified, will be attending the 32nd Annual Conference. Tim and Jim would be happy to answer any of your questions and talk about the valuable services Verified provides. 2005 was the year of sudoku. Over 300 newspapers, including USA Today and the New York Post, have added sudoku to their puzzle pages and Websites. Sudoku was made popular in the west by Wayne Gould, a former judge and lawyer from New Zealand, who came across the game during a trip to Tokyo in 1997. He then wrote a program to generate puzzles and began distributing them free to newspapers, usually in trade for a plug for his URL where he sold software to generate the games. "As a puzzle fan, I wanted to spread the word. That was the easiest way to do it," said Gould. "Second, to sell my computer program, people needed to know the puzzle first." "There's no other puzzle since the crossword craze of 1924 and 1925 that's been introduced in newspapers so quickly," said Will Shortz, National Public Radio contributor and New York Times crossword editor, who has created seven sudoku anthologies. "Most other puzzles that have become popular...took years to build up, and even then they didn't have the popularity that sudoku has." But do puzzles sell papers? "This has been a fantastic launch for any new feature. It's unprecedented," said Kathie Kerr, a spokesperson for Universal Press Syndicate, which began offering a version of sudoku to newspapers in May 2005 and already has 250 clients. "Newspaper editors feel sudoku is a natural fit to capture new readers." Mike Harvey, features editor of The Times, where sudoku first hooked English readers in November 2004 said, "No newspaper has published this and not got a reaction." Sudoku puzzles take up less column space than a traditional crossword. They can be placed near a crossword, stock listings, or any place where there is an awkward corner to fill. Puzzles are generally low-cost or free. Some papers have sold puzzle sponsorships to help recover the cost of the space. Why is it so addictive? "There's nothing quite like it out there," said Gould. "Most of the puzzles in newspapers are word games in disguise. This isn't. It isn't even a numbers game (though it looks as if it should be). It's a game of logic. So it's different and unusual. Also, it doesn't depend on language, so it can spread from one country to another. The 'rules' are very simple, so easy to understand, and yet the puzzle can be surprisingly 'deep.'" Verified's Rules and Procedures for 2006 are now updated on our Website at www.verifiedaudit.com/members.htm as a printable version (.pdf). It includes the latest information and important revisions. You'll also find our new glossary. If you have any questions, please contact Verified at 415-461-6006.